Vendors, who sell outside the New Amsterdam Market, will be forced to locate to other areas by Monday. This is according to Town Clerk Sharon Alexander who stated that the decision was taken at the council previous statutory meet. 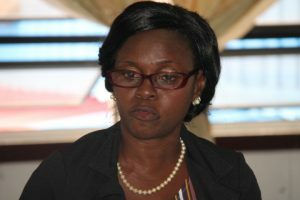 The Town Clerk, in an interview with Demerara Waves Online News, disclosed that the vendors who occupy the outer parts are only given permission to do business after 4pm but this is not done. “We can’t have a market within a market so the persons who are selling greens on the streets will be removed on Monday”, she said. Alexander related that vendors inside the New Amsterdam Market send numerous complaints because they are forced to pay a fee for spots inside while these vendors are allowed to freely ply their trade outside. New Amsterdam Town Councillor, Angelica Springer. She stated that on numerous occasions the vendors outside of the market were warned but to no avail. “The constabulary would warn them a lot of times but they still would not move. They would be fined but that fine is a contravention fee and in the bylaws it’s not a fee that gives permission to sell and that’s what some people think”. The Town Clerk stated that the vendors were informed of the decision and were given an opportunity to remove from the front of the market before Monday. 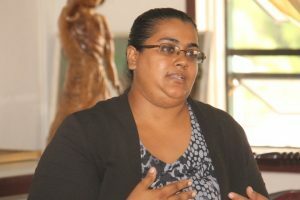 At a recent statutory meeting, New Amsterdam Town Councillor, Angelica Springer expressed concern that the municipality was taking payments from vendors outside vendors while knowing that they ought not to be plying their trade there. “Let the vendors come into the market and don’t take their money,” she said, adding that could amount to a breach of contract. Up to press time, a few vendors have since cleared from the front of the market. It is unclear whether they will be relocated inside of the New Amsterdam Market.